We have previously travelled to Portugal to make the acquaintance of John V and today we meet his son, Peter III, who died on this day in 1786. Peter was born to John V and his wife, Dona Maria Anna of Austria, in the Ribeira Palace. As the second son of the King, he was not prepared for monarchy and enjoyed a life spent in leisurely pursuits once his brother, Joseph I, came to the throne. Peter's destiny was changed though when, at the age of 43, he married his cousin, 26 year old Maria, Princess of Brazil. As the daughter of the king, Maria was the heir presumptive and when his brother died in 1777, Peter and Maria became king and queen of Portugal. Their marriage produced seven children, three of whom survived infancy. 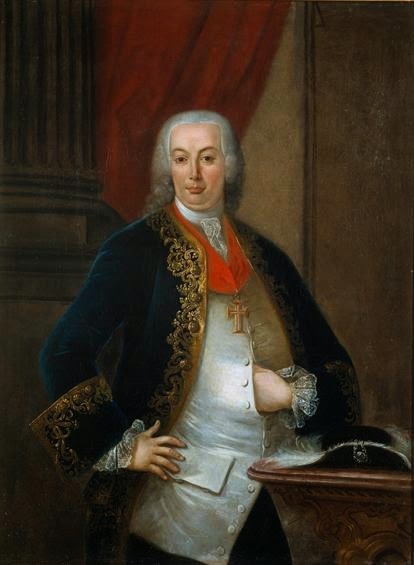 Whilst Maria was a just and well-liked ruler, despite Peter's strong support for the ruling class of Portugal, he had no interest whatsoever in the business of politics. He passed his days in outdoor pursuits or prayer and the couple's marriage was a happy and settled one. The death of her husband in 1786 shook Maria to the core and her already fragile mental health deteriorated further in the years that followed. She lived on for a further three decades, bereft at Peter's death and gradually consumed by insanity.